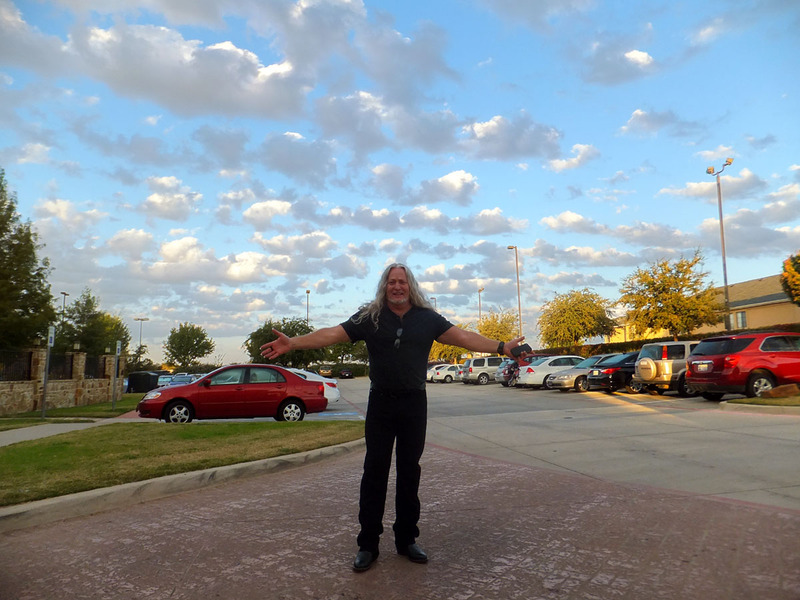 Gregg's Blogg » Blog Archive » HGG10: Day 1! I figure I’ll just keep going with what few photos I have at the moment (Hiro’s, again, for this segment), and add others into the posted blogs as they come in (we need yours!). It’s now Friday morning, Nov 2, 2012, and we had a quick breakfast with these arrivals of late last night and early this morning. 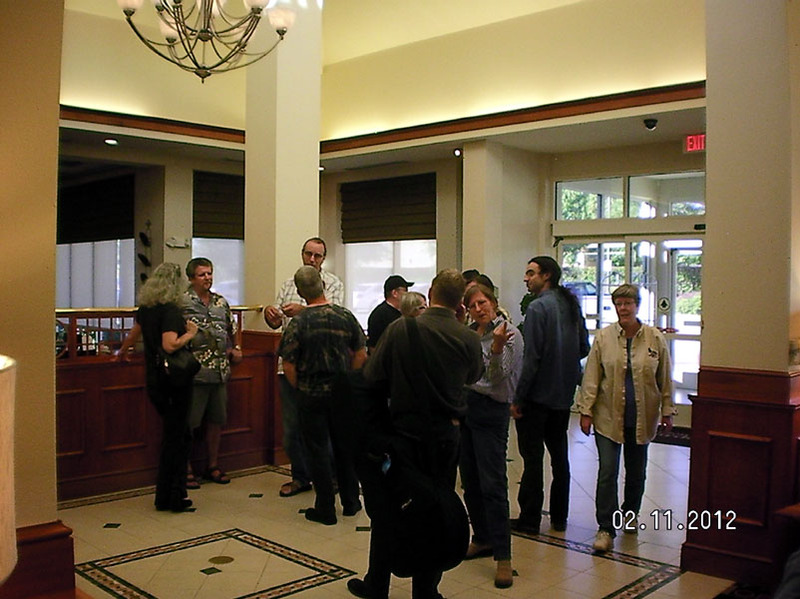 Thankfully, the Bennetts arrived safely, and Jaci, Frank and I were soon off to meet them and the Morgans at the theater to start our prep there. 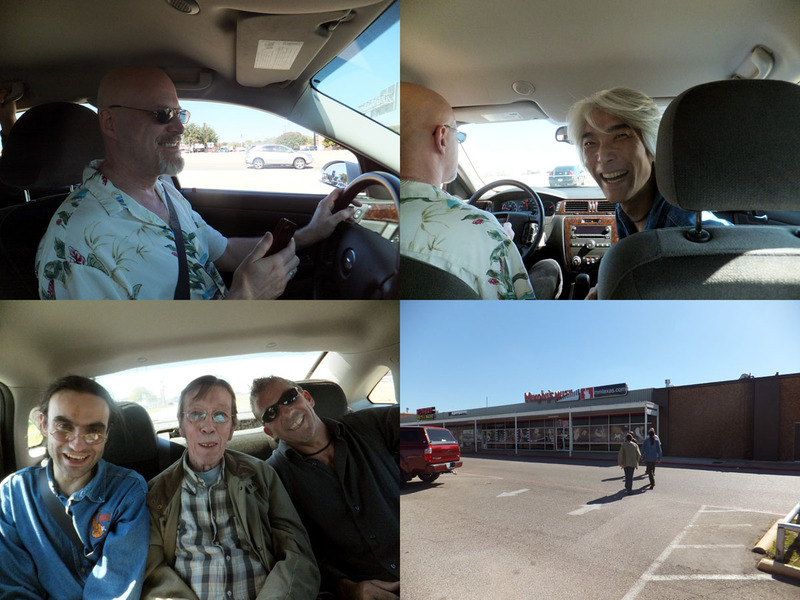 Mike Doolin drives some of the gang to a local music store for some errand (what’s the story here, guys?). Hiro in the front seat, with (for those who don’t know them) Benoit Meulle-Stef, Dave Evans and Stacy Hobbs. 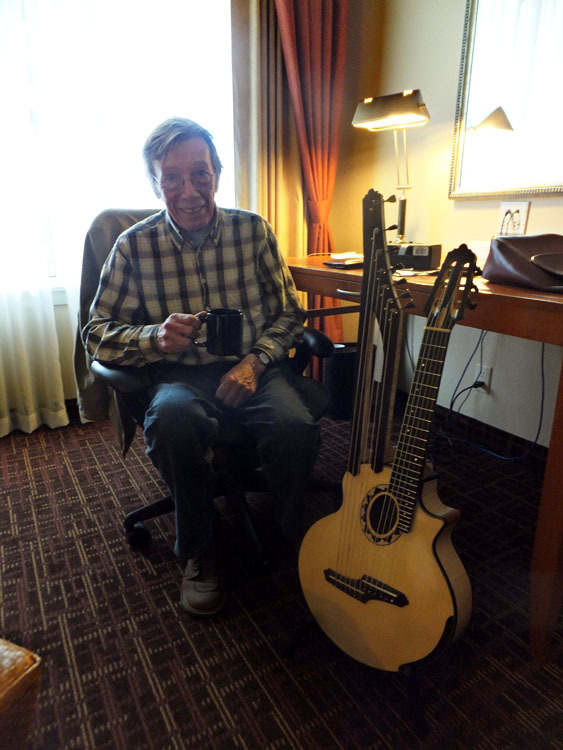 Back in the hotel room, Dave unveils his brand new carved-top and back mini harp guitar in quart tuning. A beauty that was sold (to Nancy Conescu) before I even got to see it! 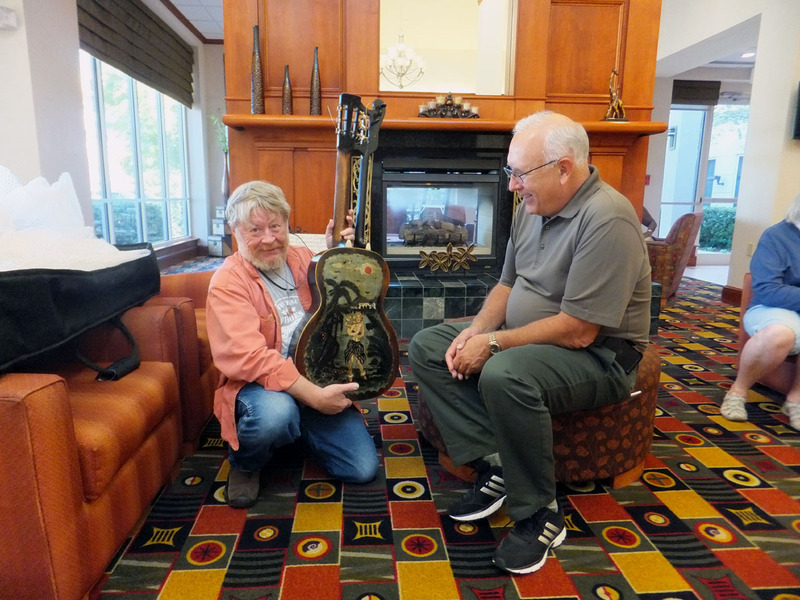 While downstairs, Dan Pease unveils his latest eBay treasure, and by “treasure” I mean “poster child for the term ‘diamond-in-the-rough’.” It’s a Bruno that has been heavily (albeit lovingly) modified in a myriad of charming ways (well, to Dan, but his eyesight’s going…). 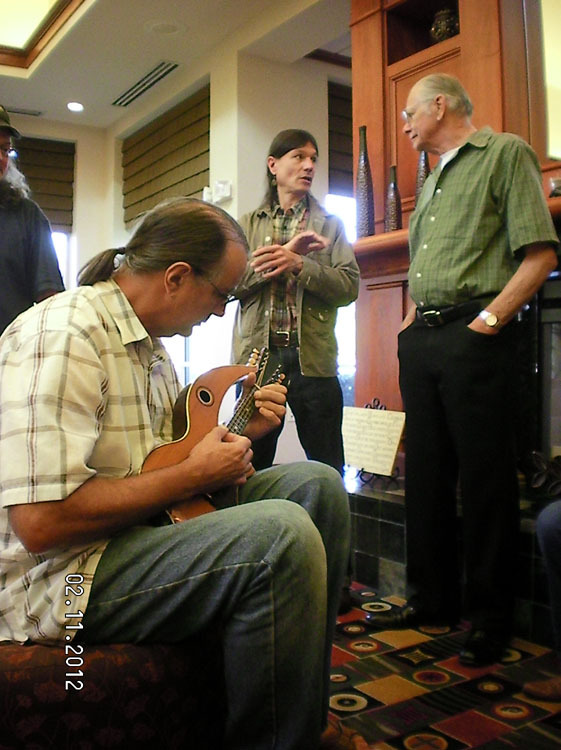 But when he showed Steve Farmer the custom-painted back, I think everyone became jealous (I know I did!). 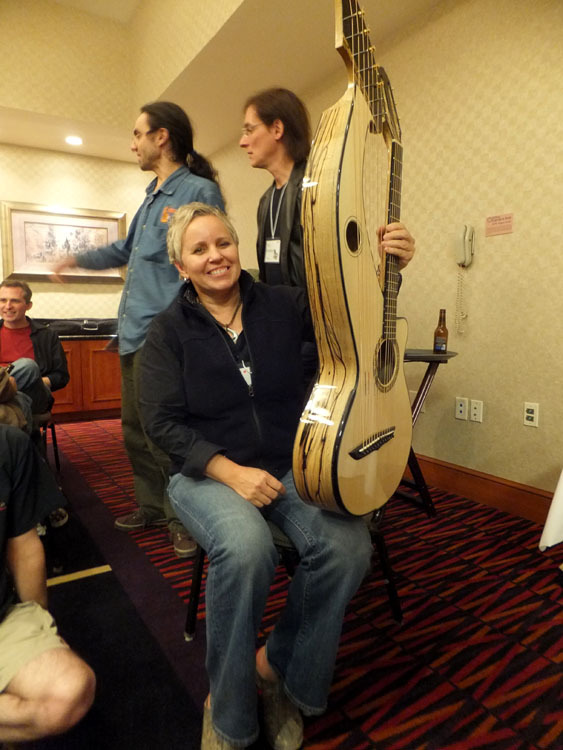 We were afraid that Kathy Wingert might not make it with her brand new (not quite finished) HG with its outrageous B&W ebony back and sides. Keith Medley, one of our first-time features, drove all the way from the Nashville area. 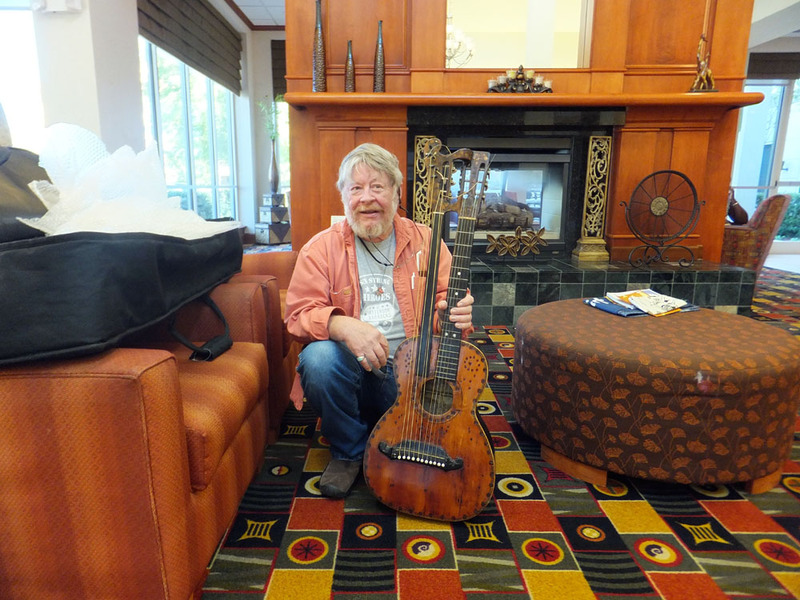 Andy Wahlberg tries out Bob Hartman’s latest Dyer harp mando find, while Martin Leykomm (a multi-Larson harp guitar owner from Germany) discusses it. Can you believe people are already jamming, and we haven’t even done dinner yet? Great photos all around! And an especially fantastic picture of Keith! Bravo Hiro! Thanks Gregg! Fret not, HGG family members, “Hula Lula” is at my local luthiers’ shop for all the needed repairs, but will retain her aftermarket bling while being ready for next year’s jams! Since she is now on the way to playability, my attentions turned yesterday to the other Bruno harp guitar iteration, and I got ANOTHER bouncing baby eBay Bruno, this one with the 12/4 string setup. It’s in (apparently) finer fettle than Lula and should be up and running even sooner (anyone out there got a vintage set of 12-string slothead tuners?). Also, Bets and I want to give our most heartfelt thanks to all who made HGGX another lifetime memory. You truly are our family–in the very best way! My heartfelt thanks to Gregg, Stephen Joe and everyone at HGG10! Thanks to your tireless efforts, what a wonderfully moving time it was. 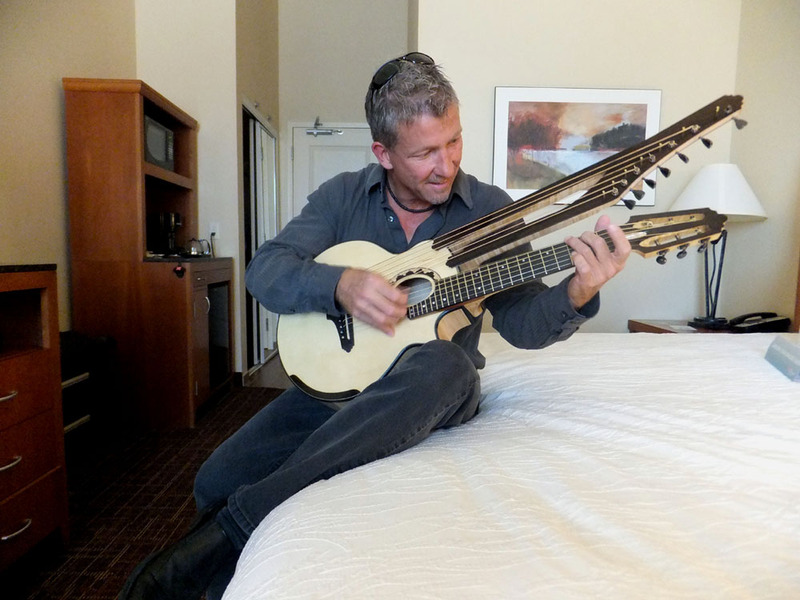 The event, musicianship and instruments on display have no parallel in the world. And the new friendships forged will change everyone’s lives. This year’s gathering had so many unforgettable moments, there are no words to express my the honor I felt for being a part of this wonderful event. What wonderful memories, and what a great time Vickie and I had at the 10th. 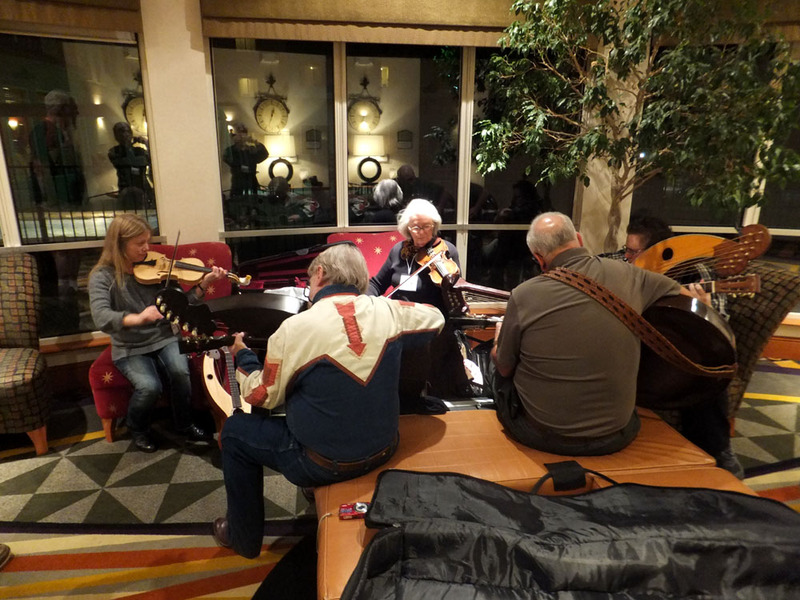 Harp Guitar Gathering. Thanks you so much Gregg for all you do to make this event one to remember. 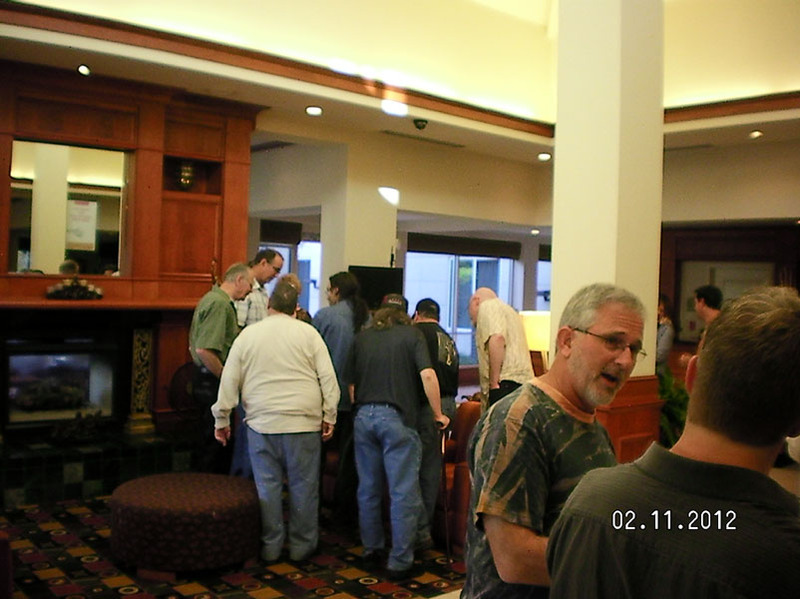 We made so many new friends and connected with old ones as well. Can’t wait till next year!